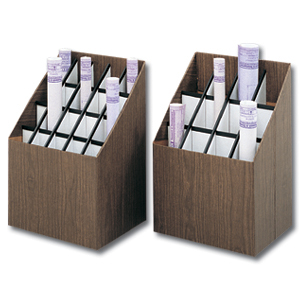 Slanted top design provides convenient access to rolled files. Light Gray frame with chrome-plated grids looks great in any setting. Bottom dust guard protects your files. Each unit has a 100 lb. capacity when files are evenly distributed. Assembles easily. FOB Shipping Point. Tubes are reinforced with plastic molding, which also prevents tears and snags. 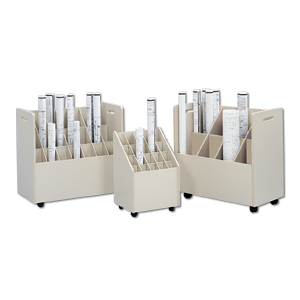 Grandstand design allows storage of various size rolls in one file. Shipped Flat. FOB Shipping Point. 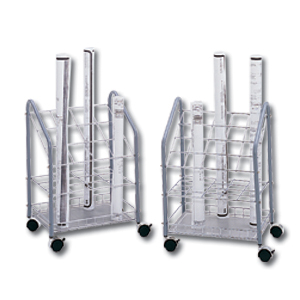 Four all-surface swivel casters provide easy mobility. 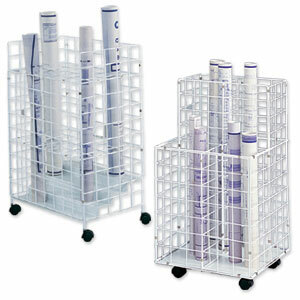 Four big 8" x 8" compartments are at two heights to accommodate any size roll. Assembles quickly and easily. FOB Shipping Point.